If you’re like me, you must have watched the wedding live and even watched the replays over and over. I don’t know about you but I felt like a giggling little girl watching Barbie & Kent live a fairytale love story. Oh, and how cute is their send-off car? Totally adorable! Congratulations again to Prince William & Kate! Cheers to happily ever after! G’day lovelies! 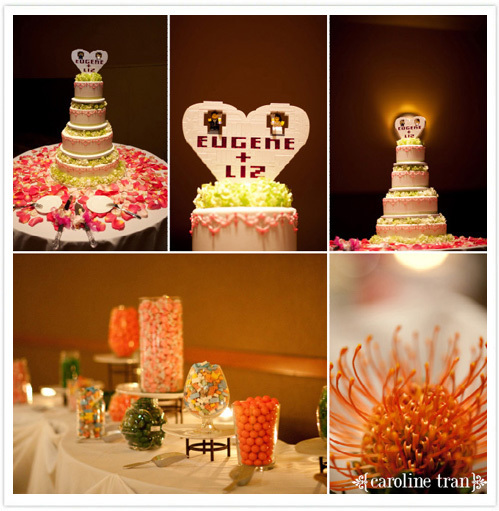 I’ve got a unique find for you today from Liz & Eugene’s downtown LA Lego themed wedding. It’s simple & quite traditional with all the here and there Lego touches. You’ll see what I mean! I love the idea of the groom having a huge role in the wedding with elements from both the bride and the groom (which is not a usual thing!). See the nice contrast of Liz’s diamonds & Christian Louboutin and Eugene’s Legos? 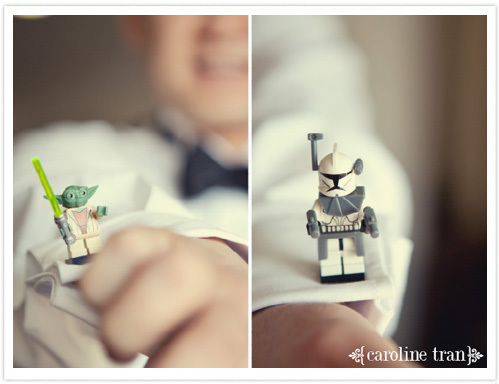 The groom and groomsmen were all wearing Lego cuff links – with a surprise visit from Yoda and stormtrooper, of course! 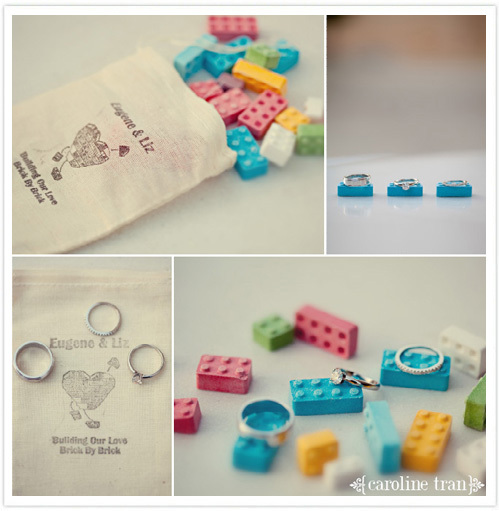 Liz & Euguene’s logo were printed on these cute canvas bag with Lego candy favors. And their slogan: Building our love…Brick by Brick! Cute! You can check out more of their amazing photos by Caroline Tran, here. The Couple. 7 years. College sweethearts. Jessica Navarro & Dennis Navarro (yes they have the same surname! speaking of meant to be) were already together as seatmates from day 1 of their college life. Having the same surnames, how they met was totally not accidental. The rest as they say is history. The Proposal. 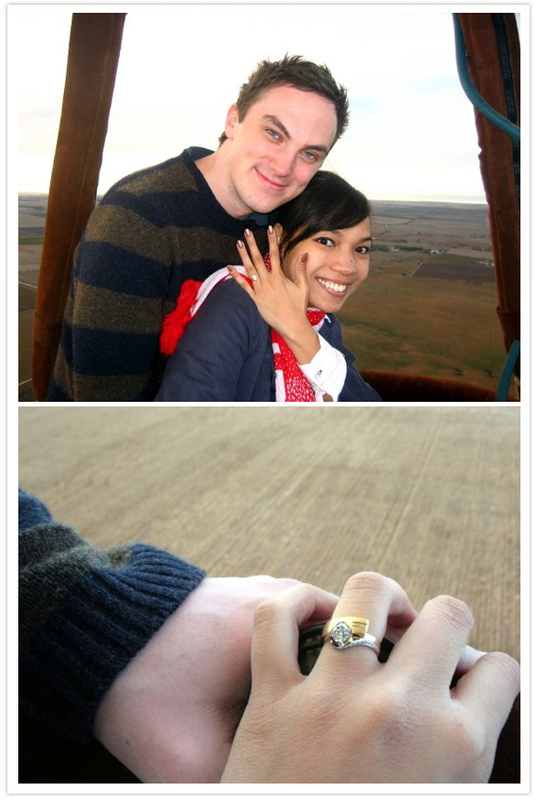 It was during their 7 days Cebu-Bohol vacation with friends that Dennis decided to pop the question formally. “We had already decided on this but i still want to make it official. I decided to give her the ring during our visit to Ogtong Cave, Bantayan Island. I thought it was a good spot since it’s an inland cave so it would be different and Jess wouldn’t suspect of it. To my surprise, the cave was filled with chest deep water so we had to leave our bags along the cave’s opening. I told Jess to go ahead and I intentionally left myself with the bags grabbing the ring and the closest ziploc bag i could grab, placed the ring in the ziploc and stuffed it inside my swimming shorts pocket. The funny thing was I forgot to remove the air from the ziploc so the whole thing kept on floating out of my shorts! I had to constantly hold it in! The Goal. Jessica & Dennis wanted their wedding day to be an intimate celebration that was simple yet personal to them. They only had a few requirements for their special day. “…we wanted it to be on February since its our anniversary month and Dennis had always wanted it to be in Tagaytay because of the cool weather. He also wanted to have a string quartet play and to get a good photographer. Everything else was negotiable. We did a lot of research and just chose what we liked and what we thought would look good“. The Design. When it came to the look of the wedding, Jessica knew for certain that she wanted black as their main color, and the rest of the decor built around that. WIth the additional touch of white, the design as she put it was “simple, chic & sophisticated“. They created great ambiance by dimming the lights and illuminating the space with candles. The Look. Jessica looked lovely in a strapless pleated gown, adorned with her button black & white bridal bouquet. Her bridesmaids wore black satin strapless dresses with white ribbons. The groom wanted something formal & classic and opted for a classic tuxedo vest with a white bow while the groomsmen were stylishly put together in black long sleeves with white ties. To add a bit of pizzaz, Jessica & Dennis wore their signature college shoes. Jessica had her favorite white Keds & Dennis with his black chucks. The Details. It was indeed a personalized non-traditional wedding- formal with a twist. 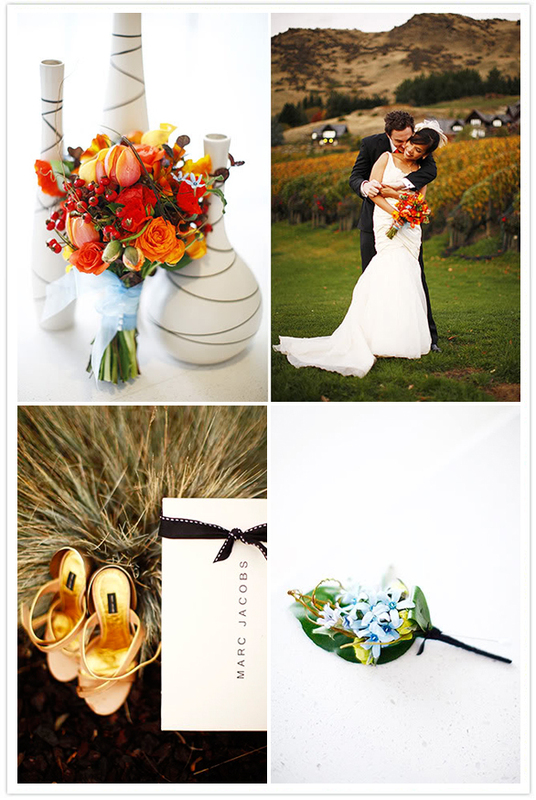 Every detail was thoughtfully chosen and designed to fit the couple’s style. For the invitations, Jessica & Dennis created their own design (including their monogram) & handcrafted everything themselves. They wanted something elegant and formal that would tie into the look of the reception. The music for the wedding was another twist. Dennis was a violinist himself so including a string quartet was a must. With a tight budget, the couple decided to have a live performance at the ceremony only. Jessica walked down the aisle to JJS’ performance of “Canon in D by Pachelbel” picked out by Dennis for its vintage, soulful vibe. Being fans of alternative music, the reception music was an offering of U2, Goo Goo Dolls, Oasis, FOB & Paramore but all translated to its classical mood by Vitamin String Quartet (VSQ). It was simply a reflection of Dennis & Jessica mixed together, from their Viva La Vida couple’s entrance to their Iris first couple’s dance (played by VSQ as well). As guests arrived at the reception, they were welcomed with black & white russian mocktails & chocolate & cream cookies. Dinner tables were topped with black satin linens and damask patterned overlay, as well as varying white paper pom poms & candle centerpieces. Black painted birch trees wired with white tiny flowers in tall glass vases delineated the spaces for the long tables. Being friends with the couple was a great advantage to offer non-traditional wedding gifts. The church decor was entirely up to friends, so Jessica (to her surprise) walked down the aisle decorated with white pom poms, rose petals & candles to compliment the rustic look of the church. 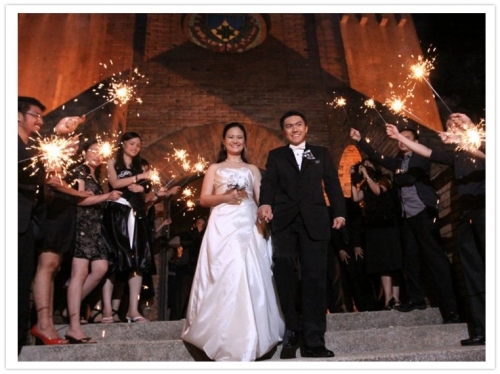 Sparklers were thrown in after the ceremony as the guests sent off the newly-wed couple. 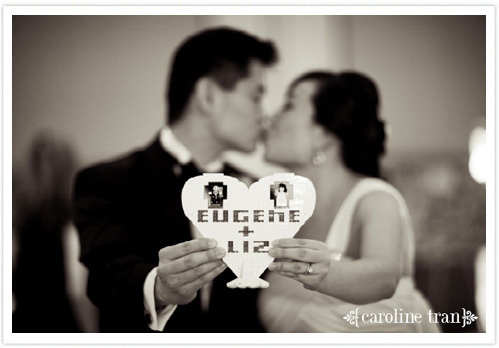 As part of guests souvenirs, Dennis created a tarpauline with their monogram and placed it along the entrance of the reception as a photobooth backdrop. Props were also all black & white – from mardi gras masks, clown hats to fake mustaches – and yes, they are all handcrafted as well!To surprise the couple even further, the best man’s toast was set outside as the “end of the program”. As guests were being served with champagne, fireworks were set-off to end the perfect night. The Moments. The wedding became an intimate celebration of 70 guests. Almost everybody knew each other. All the details were not just about the couple but it was also an extension of how the wedding came to be with all the help from family & friends. Jess: I would have to say that my favorite part of our wedding was the planning. It was stressful but fun at the same time. Seeing everyone come together, it felt great to see all our hard work pay off. Another moment I’d choose would be when we were in the ‘waiting room’ (resting room for the bride & groom before the reception begins). It was a surprise to both of us and it gave us some time to be alone and savor the moment. I actually wished we had a camera with us. Dennis: The whole wedding was just awesome. The whole plan was like clockwork and went on smoothly, from the preparations to the ceremony, until the reception. Our wedding was set at night, elegant as it is, the sparklers and fireworks made it a blast! Yes, they were really not planned and it took us by surprise! We planned the whole wedding altogether, but our wedding planner (Eliska) added value to the occasion making it modish as well. 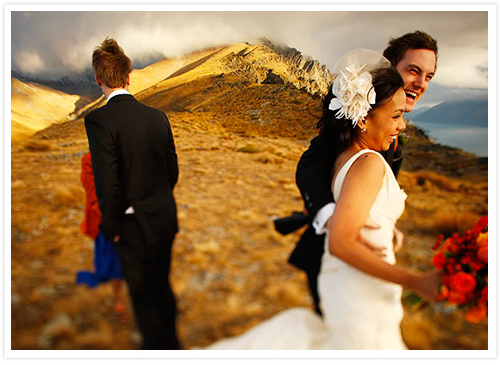 You don’t need to have an extravagant wedding to have a beautiful and perfect one. I can’t say that ours was perfect, but it sure felt pretty damn close. You just need to know what you want and have the creativity and passion for it. 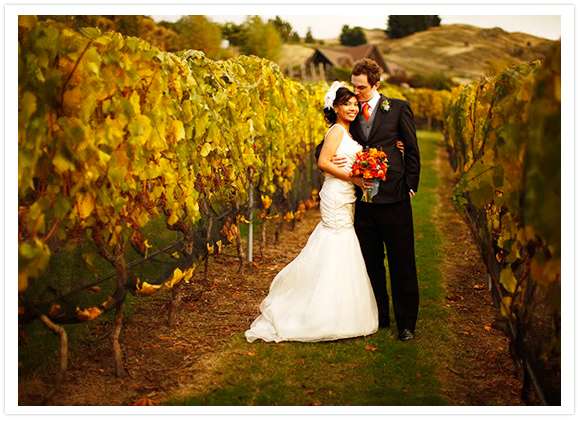 What makes your wedding special is all the personal details you put into it. Not just for your guests, but for you as well. “You’ve always seen it in movies when people fall in love, get married and then halfway realized what a huge mistake they have made. As our wedding drew near, I was wondering when I was going to feel any wedding jitters. But I never did. Congrats Dennis & Jessica! Thank you so much for giving us the honor of being part of your wonderful day! It just proves that simplicity is key to elegance & weddings don’t need to be expensive to be amazing! Just keep the creativity alive! Finally! I have been waiting for.e.ver to post Aaron & Iselle’s wedding. And I never expected it to be this difficult to edit down a wedding of someone I’m close to, especially if I have all the photos from different photographers at my disposal. I just chose those pictures that got my attention. Enjoy! Aaron & Iselle chose the reception to be held at Leslie’s Garden because of its great food & open space. It’s a nice venue for weddings during the fall because of it’s vineyard-feel with high ceilings & tiffany chairs; far from the usual spots in Tagaytay. The invitation was designed based on the couple’s motif: chocolate brown & champagne. Menu cards were placed in jars along with pencils for guest’s dedication cards. And for table numbers, wooden coasters were written with gold-colored glue. Best wishes Aaron & Iselle! Enjoy your honeymoon in Ilocos! News Flash: I just got the news yesterday that my two best friends are getting married.I was totally SHOCKED! LOL. I know they’ve been together for almost 7 years but I wasn’t just expecting it to be this soon. And as soon as they gave me the news, they also hired me as their wedding coordinator!